As the posted signs indicate, Oak Dale Cemetery in Urbana is undergoing one of two seasonal cleanups. Fall Cleanup is underway Oct. 15 through Nov. 21. During this phase, grave decorations are gathered, dead trees are removed and other organic debris is gathered and disposed. A storm packing high winds on Saturday complicated the scene by knocking down limbs on the cleanup already in progress. Oak Dale Cemetery in Urbana is undergoing one of two seasonal cleanups. Fall Cleanup is underway Oct. 15 through Nov. 21. During this phase, grave decorations are gathered, dead trees are removed and other organic debris is gathered and disposed. A storm packing high winds on Saturday complicated the scene by knocking down limbs on the cleanup already in progress. 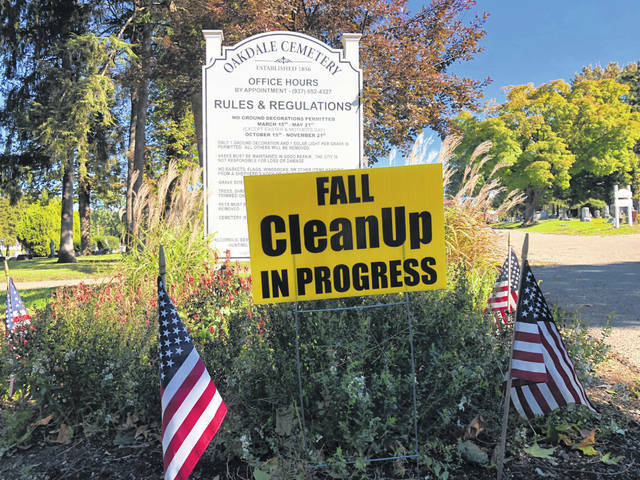 Each autumn during cleanup, old decorations and anything placed before Oct. 15 are gathered from graves and placed in one location near a cemetery building. Each spring, the same process occurs for any decoration placed before March 15. The city must remove all decorations after these seasonal dates in order to perform maintenance and tidy the cemetery for winter and summer. Decorations can be placed again on graves after each cleanup — Nov. 22 for winter placement and May 21 for summer. In the spring, there are exceptions granted for decoration placement on Easter and Mother’s Day, according to the sign greeting visitors at the cemetery’s front entrance. Oak Dale is known for its old, stately trees. While this aspect of the grounds adds to the cemetery’s historical atmosphere, some of the trees have been dying as the result of the ravages of time and recent pests and disease that have plagued other trees in Ohio. Over the weekend after the opening week of Fall Cleanup, a storm on Saturday packing 50-mile-per-hour winds and gusts even stronger caused additional debris to fall in the cemetery. Some visitors to the cemetery on Saturday and Sunday posted video and photo albums on social media of cut tree debris, grave decorations piled together and gravestones affected by the storm and the semi-annual cleanup. Emotional reactions by social media users caused these posts to “go viral” and speculation began to swirl on Facebook about what had occurred in Oak Dale. “Unfortunately, the weekend social media ‘lit-up’ with many accusations and mistruths regarding Oak Dale Cemetery’s annual Fall Cleanup. As is the process, an extensive, concentrated effort by Cemetery staff is performed twice each year to ensure the upkeep of Oak Dale’s 60 acres. Residents are given notice through multi-media sources and signs are posted in the cemetery for visitors, reminding them that this process takes place each year from October 15 – November 21 (Fall Cleanup) and again March 15 – May 21 (Spring Cleanup). Reach Brenda Burns at bburns@aimmediamidwest.com.